Our school aims to train architects, professionals able to express and argue their points of view, implement concrete solutions, develop a critical, personal stance towards their practice, and shoulder their ethical and social responsibilities. the incessant evolution of standards and regulations. 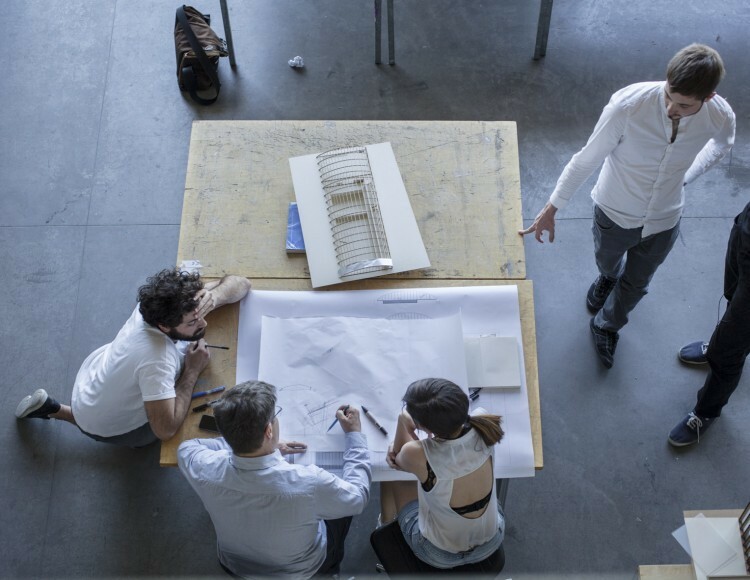 The school offers a training programme leading to a degree in Architecture, organised into two cycles: undergraduate (three years) and Master’s (two years). Students can register as soon as they have obtained the Baccalaureate or can join the course following an initial training programme. The undergraduate degree focuses on the practice of design and on acquiring the basic concepts and tools of the discipline through four complementary areas: history and theory; construction; city planning and landscape design; and representation. It concludes with the production of a thesis, a genuine initiation into research. from and use existing structures, and should recycle or reuse what is already there. These strands express distinct yet complementary ideological positions. The representations and ideas that underpin them are clearly outlined: this is the best way to allow students to construct their own architectural stance as well as to traverse a series of unique worlds throughout their training. Over these years of study, students come into contact with the professional world through an extended internship. We also allow them to take a gap year to obtain further experience if they wish to do so. run in partnership with the École des Ponts ParisTech, explores the issue of the impact of buildings and infrastructure on the environment in greater depth. areas which give rise to themes such as risk management, territorial autonomy, agriculture, tourism, and so on. architectural documents”). Research activity is structured as far as possible around the issues taught on the undergraduate, Master’s and postgraduate courses, which feeds teaching in turn. public visit to the design workshops which welcome the expertise of figures outside the world of architecture. These discussions allow us to assess our work and so better develop our teaching. Finally, this openness manifests itself in the form of numerous conferences which we organise on key themes in our teaching: social transition, metropolisation, territorial representation, or even the issue of the digital in architecture, which is revolutionising contemporary practice. Our open approach is strengthened by discussions at the international level, and by numerous overseas study trips aimed at enriching our students’ learning.